​I love posole! I also love kabocha squash. 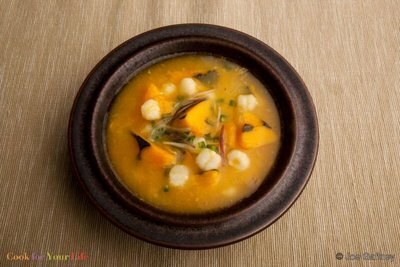 The taste of kabocha and the white hominy used in posole are the perfect match. This Pumpkin Posole soup is really simple, but not a good choice if you are in a hurry. You need time for the hominy to cook. It can take a couple of hours or more of simmering for the grains of hominy to burst into ‘flowers’, but after that, it goes very fast! Preparation1. Drain and rinse the hominy. Put it into a large pan and cover with water by 1-inch. Add the bay leaf and garlic and bring to a boil over a high heat. Cover, and reduce the heat to low. Simmer for 2-3 hours or until the hominy has burst into ‘flowers”. Check the pot from time to time and add more water if it looks dry. 2.While the hominy is cooking, with a peeler, take off little patches of skin all over the pumpkin halves until they look polka dotted! This is purely decorative and can be left out if you don’t have a lot of time. (FYI – butternut squash has harder skin and must be completely peeled) Cut the halves into ½ ” dice. Set aside. 3. Heat the oil in a large soup pot over a medium-high flame. When it ripples, add the onion and sauté stirring until it starts to soften and turn transparent. Add the pumpkin cubes sprinkle with a little sea salt, mix well and cover. Turn the heat down to medium low and sweat the vegetables for about 10 minutes or until the pumpkin has started to soften, and the onion is really soft. The onion should not brown so stir the pot occasionally to make sure it doesn’t stick. Add 6 cups of water or stock, and the cooked hominy along with any liquid left in the pot. Bring to a boil, cover then turn the heat to medium low and simmer until the pumpkin is tender but not mushy, about 20 minutes. 4. While the soup is cooking, prepare the garnish. Mix the cilantro, shallot and jalapeno together in a little bowl. Put the other garnishes into separate bowls. Eat the soup with a squeeze of lime juice, and a little of the other garnishes to taste. Chipotle in Adobo is a great pantry item. Smoked, dried chipotle chilies are stewed in adobo sauce until they are soft, then jarred or canned. They make food deliciously smokey without using a shred of smoked meat, like in this Chipotle Greens recipe. 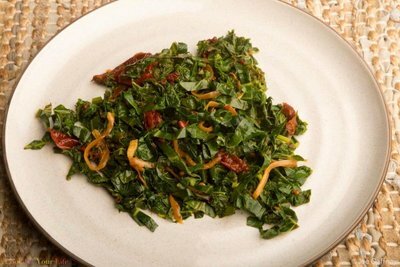 They make these powerfully spicy greens not only taste great, but offer wonderfully healthy way to update a southern classic. 1. In a large saute pan, heat olive oil over a medium heat. Add onion and garlic. Season with a sprinkle of salt and reduce to medium low heat and allow to cook slowly until onions and garlic begin to brown. 2. Stir chipotle into onions and garlic. Allow to cook 2 minutes until the onions have taken on a reddish color. 3. Add the kale and collard greens. Cook until tender, about 10-15 minutes, adding a splash of water if needed. Season with non-iodized salt and serve. And Nancy Ramirez has some good tips on how to eat on a budget! 1. 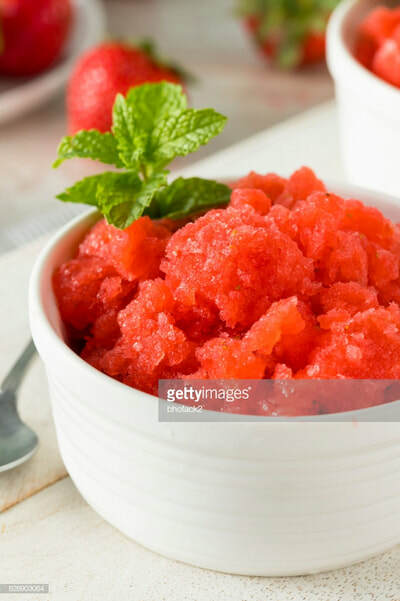 Put all the ingredients except the coconut into a food processor and blitz until everything is blended. If you’re using a Thermomix, blitz on speed 9 for about 10-15 seconds or until the mixture comes together. 2. Using slightly wet hands, roll tablespoons of mixture into balls. 3. 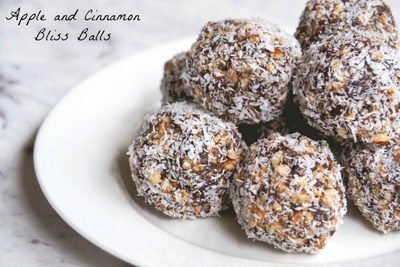 Roll the balls in the coconut and put them in the fridge to set. 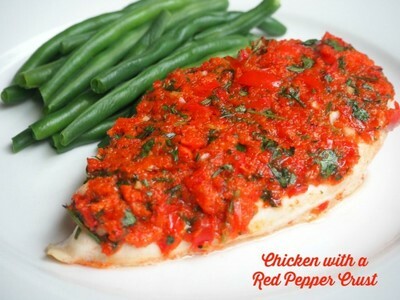 This chicken dish ticks all the boxes; it’s fresh, healthy, low fat and low iodine! We tried this in a low iodine phase but we loved it so much, it’s become a family favourite! We love that it’s easy enough for a midweek supper but elegant enough for entertaining too! Preheat oven to 200 C / 180C fan-forced. Put the chicken in a shallow ovenproof dish and season. Roughly chop the capscium and chop the garlic. Put in a food processor with the parsley and pulse a couple of times until coarsely chopped OR put capsicum, garlic and parsley in Thermomix and chop for 2-3 seconds on speed 7. Stir through the olive oil and season with black pepper. Spread the crust over the chicken breasts. Spoon two tablespoons of water into the base of the dish and roast the chicken breasts uncovered, for about 20-25 minutes. Serve with pasta, couscous, baby new potatoes and/or green veggies/salad. TIP! If you’re eating low iodine, just use pepper to season. Sprinkle some chilli flakes or add some fresh chilli at stage 2 for an extra kick. For each freezer meal, place all of the ingredients in a gallon-size Ziploc bag. It’s helpful to label the bag with a Sharpie before you add the ingredients. I write the date and cooking instructions on the bag. Remove as much as air as you can and seal the bag. Flatten out the ingredients and lay flat in the freezer. Once frozen, you can stand the freezer meals up vertically to make more space. To cook, defrost the freezer meal in the refrigerator overnight. Pour ingredients out into the crockpot. Cook on low for 7 to 8 hours or on high for 3 to 4 hours. Right before serving, remove the chicken, shred it, and then return it to the crockpot. Serve the Southwest Chicken in salt-free tortillas (check label for other non-allowed ingredients) for burritos or tacos or with rice for a rice bowl. Some homemade LID-safe salsa would go perfect with these meal. If you are not on the low iodine diet, you can enhance your meal with cheese, sour cream, pickled jalapenos, etc…. The possibilities are endless. Combine the oats, dairy substitute, sweetener, and vanilla in a Mason jar. You can include your add-ins now or wait until you are ready to eat your oats. Stir to combine. Place the lid on the Mason jar and store in the refrigerator for up to a week. Using a fork, pierce the eggplants all over. Place the eggplants on a baking sheet and cook in the oven for 1 hour, turning half-way through cooking. Remove from the oven and let cool. Cut off the ends of the eggplants and discard. Peel off the skin. Use a spoon to scrape off any flesh left on the backside of the peel. Place the eggplant flesh in a large bowl. Using a fork, mash the eggplant. Add the 1/4 cup tahini, garlic, 1/4 cup lemon juice, and cumin and mix well. Season with non-iodized salt, then taste and add more tahini and/or lemon juice, if needed. Spread into a serving dish and drizzle with the olive oil. Serve with pita bread. ​Spark People Recipes is a great place for all kinds of healthy eating, also great for diet and exercise advise, check them out! ​Place ingredients in the order listed into bread machine. Set to dough and allow to finish cycle. Remove from machine and place into two loaf pans. Let rise an additional 60 minutes in pans. Bake in oven at 350 for 30 minutes or until golden brown. each loaf can be cut into 10 pieces. Combine all ingredients except beef in a saucepan, cook over low to medium heat for about 15 minutes - enough time for flavors to begin to meld. Mix all ingredients. Adjust seasoning to taste. Check out Chef John's Low-iodine dessert on YouTube! YUM! We love this one!